Please register under the separate Tuesday listing. Pleaase let us know you will be attending this unique, free event! 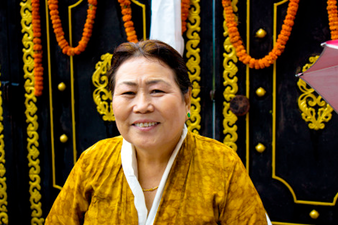 Sangyun Kamala Rinpoche, the wife of the late Chatral Sangye Dorje Rinpoche will visit our city to offer teachings. Thomas Merton visited with Sangyun Kamala and Chatral Rinpoche in India during his final journey, shortly after meeting His Holiness the Dalai Lama and before Merton’s untimely death in Bangkok. Sangyum Kamala was born in the northern Indian State of Himachal Pradesh into an extraordinary Dharma lineage. Sangyum was raised in an environment infused with Dharma practice, the blessings of faith and the power of Secret Mantra. At the age of 20, she married Chatral Sangye Dorje, the greatest Dzogchen master of our time. They were married for 50 years before his passing Dec 30, 2015. During her entire life, especially the half century spent with Rinpoche, Sangyum Rinpoche received an uninterrupted stream of Dharma teaching and transmission, and has practiced mainly in the Dudjom Tersar and also in the Longchen Nyingtik traditions. Sangyum Rinpoche has constantly supported the retreat practice of countless sublime yogis and yoginis throughout Nepal and India under the guidance of Chatral Rinpoche, and especially she has demonstrated her deep compassion by caring for the humblest of the humble in both material and spiritual ways. She carries on Chatral Rinpoche’s example of freeing lives every year in Calcutta by releasing millions of fish into the Ganges and has constructed numerous stupas, prayer wheels, and other holy supports in both India and Nepal. For more information please call or email DrepungGomangCompassion@gmail.com.